Yesterday I attended the MSU World Usability Day which focused on usability and accessibility not only for the web but for the physical world. The theme of this years World Usability Day was sustainability. One of the main themes throughout the day was there is a large difference between things appearing to be usable and their actual use. Below is a run through of the day with a few things I wanted to highlight. There were two break out sections, I attended the WCAG 2.0, ARIA and AJAX presentation. It combined low level introductions of the current and future standards and how they are applied. I was surprised to see how little the browsers are taking advantage of these accessibility standards. Firefox 3.6 implements the most, 47 of the 59 total ARIA roles. They also did a recorded session using Jaws (this was my favorite part of the day) with a regular HTML page, regular AJAX and ARIA enabled AJAX. They were nice enough to put the examples and videos online for everyone to see. It made an amazing difference watching the video and see just how easy it was to add ARIA into AJAX applications and actually make your site usable to users on a screen reader. A panel presented the Contemporary Issues of IT in the Sustainable Global Knowledge Economy. This was very interesting because it went beyond the typical accessibility and talked about access. Starting with delivering broadband to rural areas, currently 500,000 Michigan homes are in rural areas where no broadband service is offered. Using the governments stimulus incentives this could all be changed. Then more locally they talked about how ITEC Lansing is transforming the technology skills for Lansing’s youth. Sharron Rush from Knowbility then talked about how IT is changing the game for people with disabilities, given them the ability to access the outside world like no other time in history. She really put it in perspective when she did an exercise that explained by the time you are 80, a large majority of people (around 90%) will develop a some type of disability. We did a usability study with household alarm clocks. We had four different clocks and had people estimate how easy/hard it would be to change the time/alarm. We then timed them changing the clock’s time and if they were successful or not. We then had them give an actual score to how easy/hard it was and comments to why it was that way. Only one clock turned out to be easier than expected. The final results should be up soon. An interesting presentation by Shane Schulze from Ford about hybrid cars, batteries and where it is going. During the Q&A a very good point was brought up by a participant who was blind. She asked what Ford was planning to do about how silent electric cars are. She walks everywhere as do people without disabilities and silent cars are a big hazard. This was a great question, unfortunately Shane didn’t have a concrete answer at the time. I really hope this topic stays on Ford’s and the other car manufacturers radar. 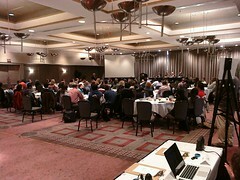 I wanted to thank everyone from the MSU Usability & Accessibility Center who put this conference on. The MIUPAand all the vendors who made this happen. It was a great experience and I encourage anyone to attend a World Usability Day event near you next year. Remember, it is us, the every day workers who can make the largest impact in usability, accessibility and access. Don’t accept the status quo, be a leader and demand access for all. Just because you have a disability doesn’t mean you should be locked out of information. Glad you came to World Usability Day! 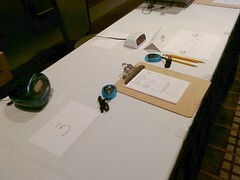 Thanks for volunteering to help Michigan Usability Professionals’ Association with the live usability testing in the afternoon, it was an “alarming” success! I really enjoyed the eGovernment session at the end of the day – I had no idea the steps Oakland County has taken with social media to reach out to citizens.